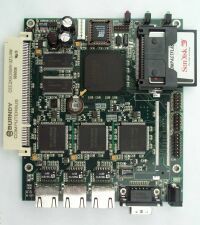 This compact, low-power, low-cost, advanced communication computer is based on a 133 Mhz 486 class processor. It has three 10/100 Mbit ethernet ports, up to 64 Mbyte SDRAM main memory and uses a CompactFlash module for program and data storage. It can be expanded using a MiniPCI type III board and a low-power standard PCI board. It has been optimized for use as a Firewall and VPN Router, but has the flexibility to take on a whole range of different functions as a communication appliance. The board is designed for long life and low power. It will be available in any volume in the standard version, and as board only or with a small metal box and various power supplies. The board can be customized according to requirements when ordering higher volume.